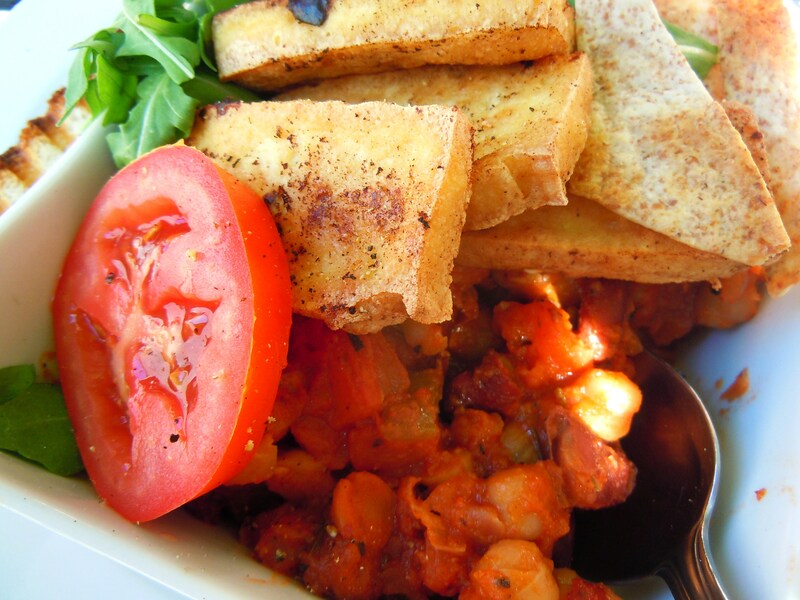 Flavour Favourites – 5 Great Tofu & Tofu Scramble Vegetarian & Vegan Brunch Dishes! I’m so happy and excited! 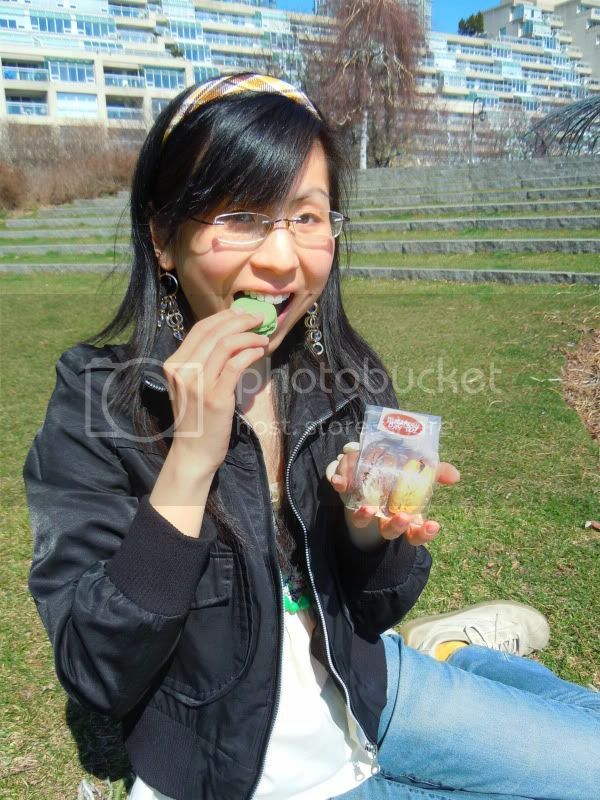 I finally have enough posts to do a Flavour Favourites post for one of my favourite foods: TOFU! And not just any post devoted to tofu, this is a special tofu and tofu scramble brunch edition post! Even though I’ve been eating tofu almost all my life, it wasn’t until I started my crazy food exploration 4 years ago that I realized just how versatile it was as a vegetarian brunch main. I was especially intrigued by tofu scramble and the more I saw it on vegetarian and vegan brunch menus, the more I wanted to try them all. 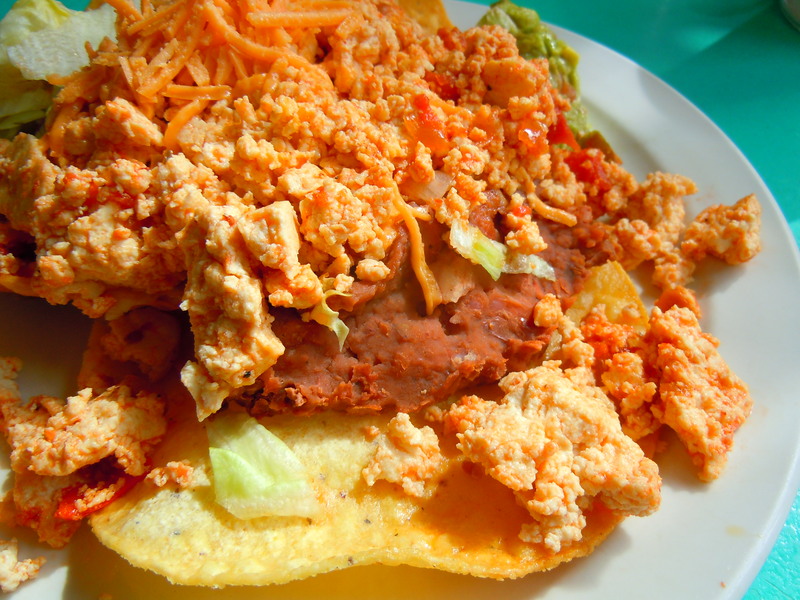 Tofu scramble with vegan cheddar, tofu scramble with spinach and diced onions, on crispy corn tortillas, with peppers and spices – I totally have a “gotta catch ’em all!” mentality towards it now and it’s been so much fun trying the dishes that I have and discovering new eateries and hot spots along the way. 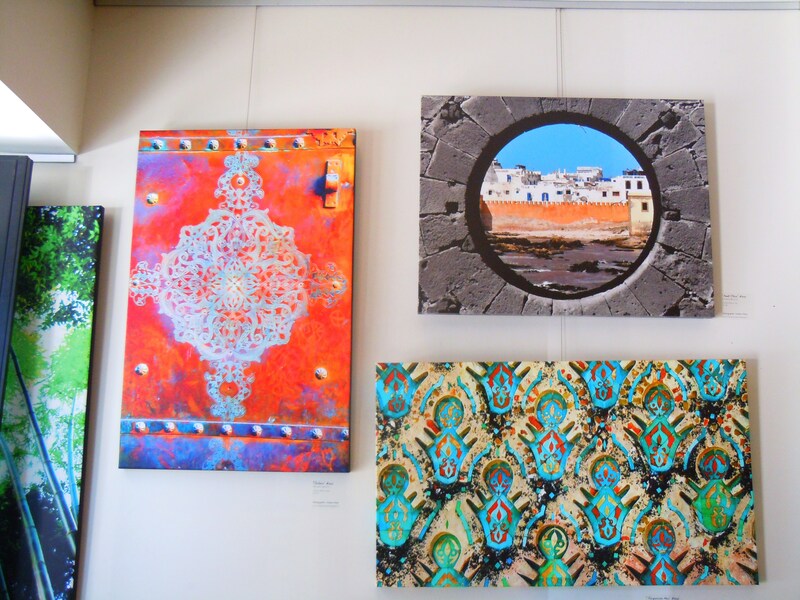 Oh, and did you notice the snazzy photo collages?! I love them, they’re so pretty if I do say so myself! I didn’t actually create the backgrounds, I just picked the template and plugged the photos in. But it was fun nevertheless! I’ve been feeling so sad about my lack of scrapbooking that I felt compelled to do something colourful and creative with my photos. It’s been tough. Ever since I started working full-time M-F, scrapbooking just hasn’t happened and it certainly hasn’t been because of a lack of desire. It’s purely a lack of time. I hate even saying it because it makes me sound like a person who whines and complains about not having enough time, making excuses, and not doing anything to change it. Believe me, I’ve made an effort. I’ve bought new materials for projects on my to-do list, I developed some new photos for new layouts. But with a M-F full-time schedule and weekends jam-packed with getting and preparing blog stories and content and fitting in time with my boyfriend, friends, and family, there has been virtually nothing left for quiet, undisturbed sit-down time with my paper and scissors. I want to change this so much so here’s to hoping I find a way to do it because this was one of the major reasons why I started Ate by Ate in the first place. Let’s get this tofu brunch show started! AND, if you’re interested in trying tofu brunch dishes that I haven’t blogged about yet, here is my tofu goldmine “to-eat” list! I’m not quite ready to unleash Ate by Ate’s Fall Harvest series just yet, so I thought it’d be fun to do a bit of a lead-in to get us all revved up first! The best thing about fall food is the warm and fuzzy comfort factor and chili and stews are some of the best meals to induce that great cozy cocoon feeling. Enter the vegan chili series to Ate by Ate! Over the past year, I’ve come across a number of places around the city that serve their own unique interpretations and versions of vegan chili and I’m so excited to start this new series, not only as an individual series, but also as tie-in to the upcoming Fall Harvest series on the blog. Why the interest in vegan chili though, and how did I become interested in vegan chili in the first place? Let it be known that I absolutely hate beef chili. I may not be vegetarian or vegan, but that certainly doesn’t mean I enjoy all meat dishes and beef chili is one such meal I’d turn the other cheek to. I can see myself enjoying turkey chili and I’m actually really looking forward to making some of my own in the near future, but for the time being, vegetarian and vegan chili is my way to go. I have so many vegetarian and vegan friends (some of you might be reading this right now!) and I thought this would be a great way to introduce some veggie meals and the places that serve them to you all so you can tuck the information away for future reference. Or if you’re really into what I post, you might just run on over right now and try the dishes out for yourself! The first time I had vegan chili was 3 years ago when I was a newbie grad student eating lunch at The Grad Lounge at York. As an every day, permanent menu item, the vegan chili was one of the most popular meals and I was constantly seeing people order it with the cute little corn muffins for lunch. Growing up though, I was never the biggest fan of chili (I blame the beef varieties for turning me off) so even though I knew so many of my friends and classmates enjoyed it, I shyed away from it at first. Then temptation and curiousity took over and I said to myself, “to hell with it, I’m getting me a bowl!” And from then on, my chili ways changed forever and their vegan chili became one of my favourites, especially during the fall and winter. Granted, my chili remained vegetarian as opposed to vegan at times because of the side of sour cream I’d order, but the meal itself is vegan through and through and a well-loved meal among the graduate student community. Now, let’s get started with the first post of this vegan chili series! 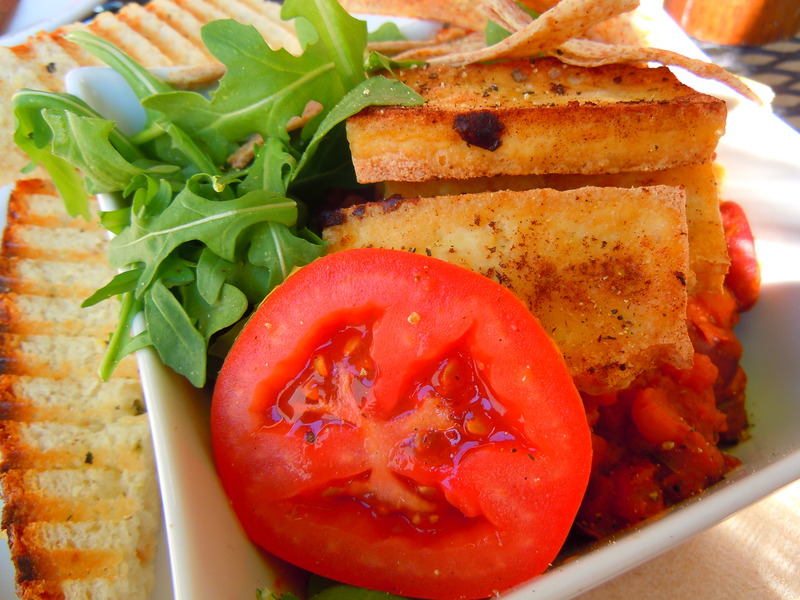 First up, the grilled tofu on vegan chili brunch at Niche Coffee & Tea Company! I mentioned this brunch dish in my first Niche post almost two weeks ago and I was itching to have this showcased in the series the second I found out the dish existed on the menu. 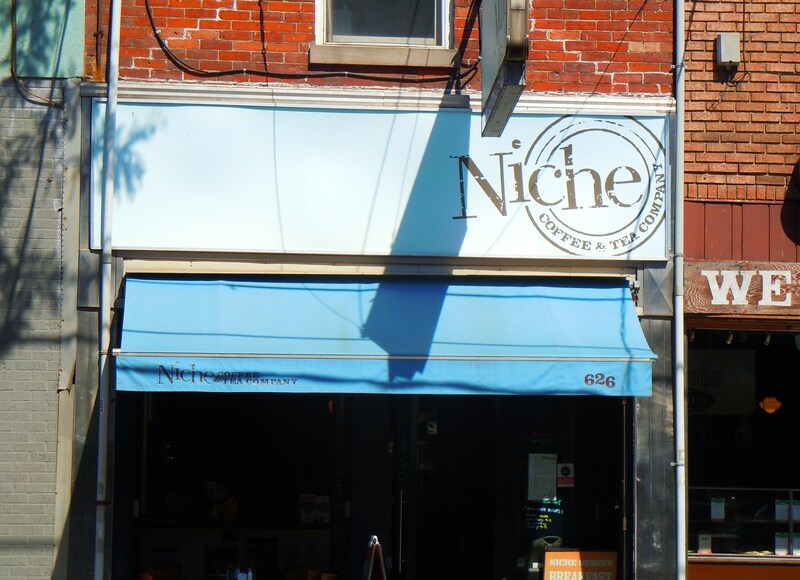 Niche is a coffee, tea, and brunch cafe located on Queen Street West just west of Bathurst St. with everything from eggs benny to French toast to omelettes to banana bread with Nutella and cinnamon sugar. 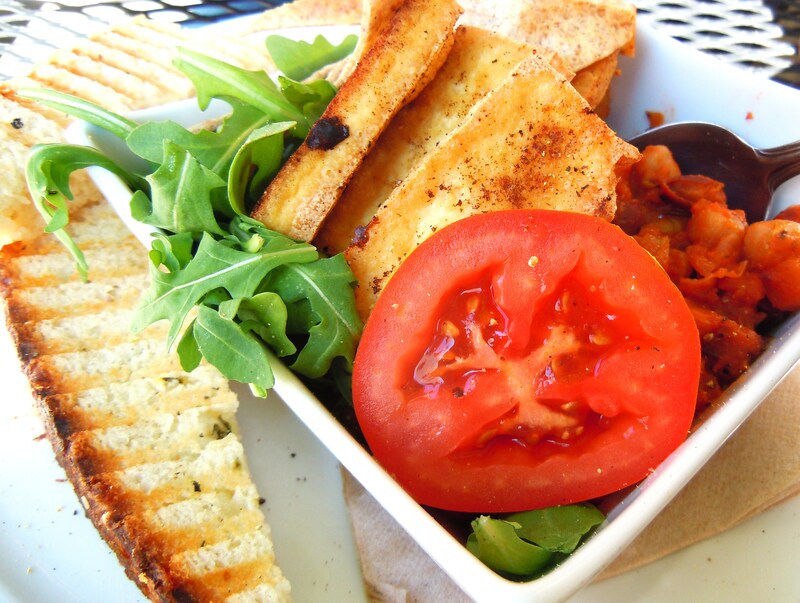 Their vegan chili is served two ways: vegetarian with eggs, or vegan with grilled tofu, and both styles ($10.50) come with your choice of either homemade grilled foccacia or cornbread. I was so excited to order this that I was fidgeting in my seat and probably grinning like a fool when the nice waitress came around to take my order. And that excitement wasn’t die down when my food came. Behold! 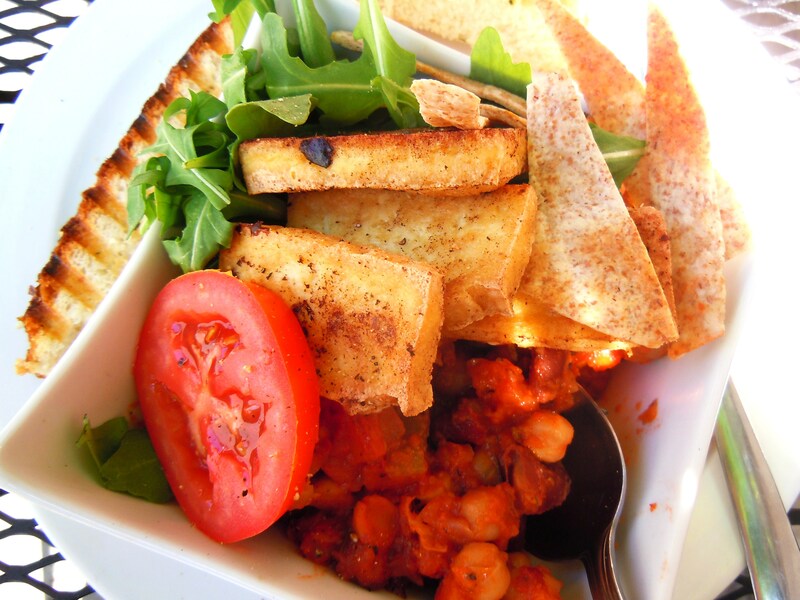 What we have here: a nice big bowl of chili made with spiced tomato curry puree, chickpeas, red kidney beans, diced carrots, celery, and corn, served with 4 grilled tofu steaks, strips of crunchy baked tortilla chips, a slice of fresh tomato, arugula (no guacamole for this time unfortunately, but that wasn’t a big deal), and grilled wedges of fresh foccacia. Oh my goodness, there were so many wonderful things about this meal. First, the chili had some kick to it! If you can’t tolerate heat in the slightest amount, this might not be the most comfortable meal for you to eat, but if you’re like me and you can take a bit of kick, you will LOVE this! The flavour is so different because it’s not your run-of-the-mill crushed tomato chili. It’s almost like a fusion of curry, tomato, and chili and I enjoyed it so much. The grilled tofu steaks were perfection. They were so cute, like mini decks of tofu cards 😀 The texture was firm, the flavour was savoury, and there was that slight crispness around the edges from the grilling that made it even more delicious. 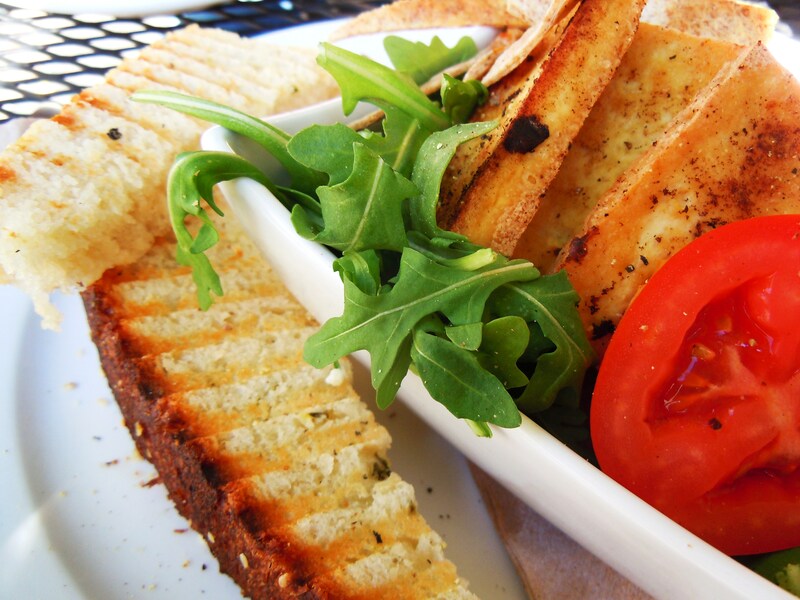 The crunchy tortilla strips were a fabulous addition and the foccacia…oh man. I think the grilled foccacia wedges I had with this meal might have been some of the most delicious bread I’ve ever had. The edges and outsides were crisp and the insides were amazingly soft and the bread just melts in your mouth. It had a wonderful rosemary-thyme and olive oil flavour and I literally said, “ohhhh my god, this is so good” out loud after I took my first bite of it. The whole vegan chili and tofu dish worked so well because of all the different textures (soft, crispy, juicy, moist, etc.) and all the flavours. Even though I was drinking water with my meal, the tofu and foccacia is the perfect complement to the heat from the chili because it mellows it out and you get the best of all the flavours when you alternate between all the items of food. If you try this out, I hope you’ll all enjoy it as much as I did. If you have suggestions or requests for the series, feel free to leave a comment! This is the first of hopefully many more vegan chili posts to come! 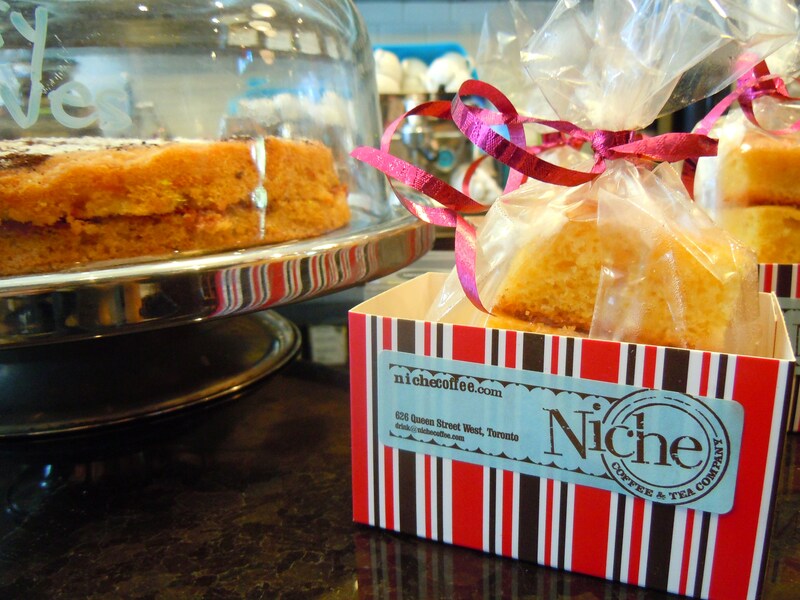 Niche Coffee & Tea Company is located at 626 Queen Street West just east of Palmerston Ave. and west of Bathurst St. They serve brunch during all hours of operations and are open 7 days a week at 8am on weekdays and 9am on weekends, with closing hours at 5pm on all days. 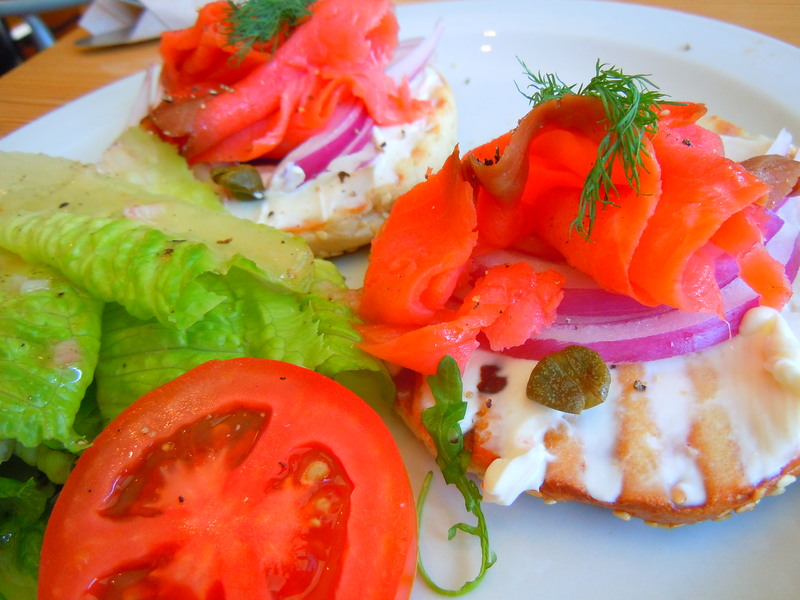 A Scrumptious Smoked Salmon & Cream Cheese Bagel – An Introduction to Brunch at Niche on Queen Street West! 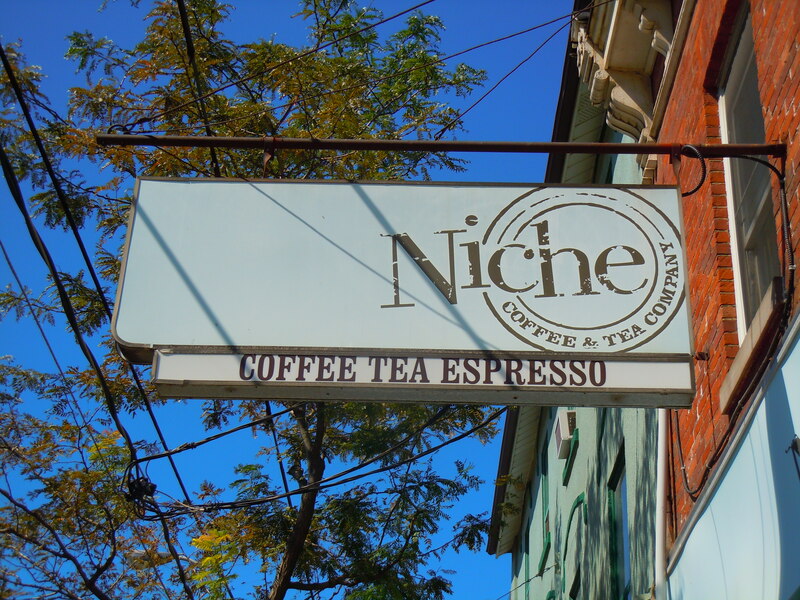 Given how this weekend marks the 9th annual Queen West Art Crawl in the city, I thought it’d be a great time to introduce another fab café on the West Queen West strip: Niche Coffee & Tea Company! Art has been such a huge part of my life since my kindergarten days of holding crayons and smearing paint on kraft paper (like you couldn’t tell from all the scrapbooking, right? ), so I was really excited to finally go to the Queen West Art Crawl last year to enjoy the outdoor art show at Trinity Bellwoods Park, sidewalk art, and all the art installations along Queen West. 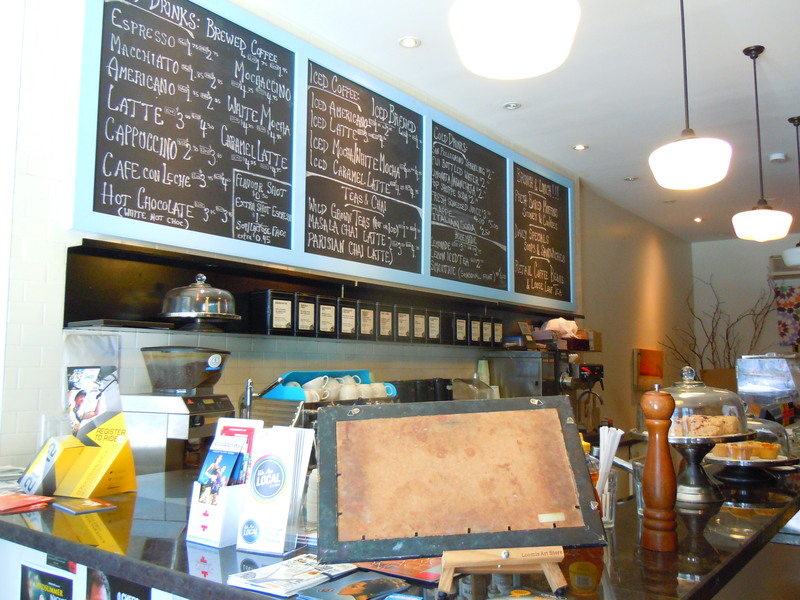 It was during this trek last year that I found Niche with its signature baby blue and brown storefront signage stamp, just east of Palmerston Ave. and west of Bathurst St. It took my tastebuds forever and a half to make their way back, but they finally did! And I am SO happy that they did because holy hell do they ever have a brunch menu to die for! Their brunch is served all-day and I can say with eager certainty that their brunch menu is one that I would be happy to eat my way through. 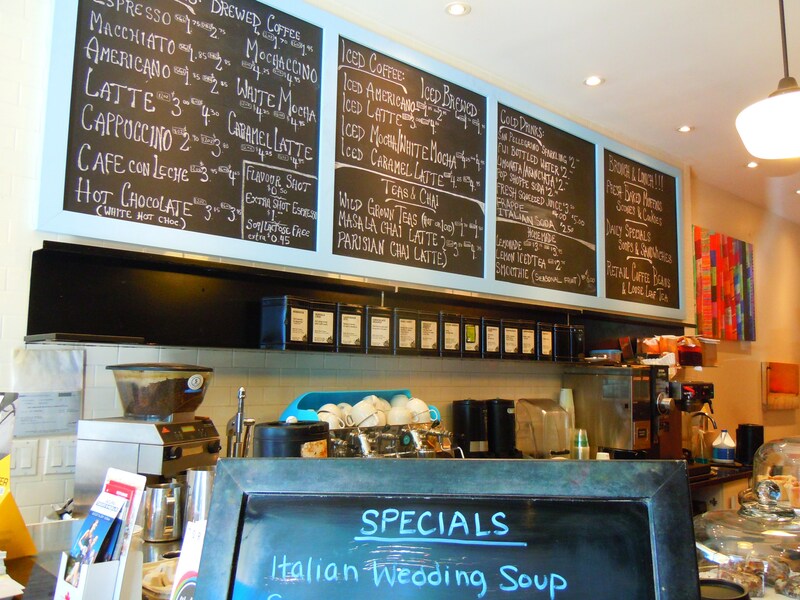 For starters, their menu is really well-rounded because it incorporates a least one item from almost all of the popular brunch favourites that we love so much: egg breakfasts, omelettes, French toast, eggs benedict, and breakfast sandwiches. You might be looking at the list and thinking, “well, it sounds kind of run of the mill, stuff I can get anywhere”. Not to ruffle your feathers, but if you’re thinking that, you are wrong. No, no, lovelies, it is SO much more than that. What makes their brunch really unique is all the sides you get with all the brunch mains. Just reading through the descriptions will make you salivate and make your heart beat a little faster because there’s just so much yummy food that’s included with everything! You have sides such as pan-roasted lemon herb potatoes, greens with maple dijon dressing, homemade foccacia, pumpernickel toast, challa bread, chicken chirizo sausage, and sweet potato rounds. 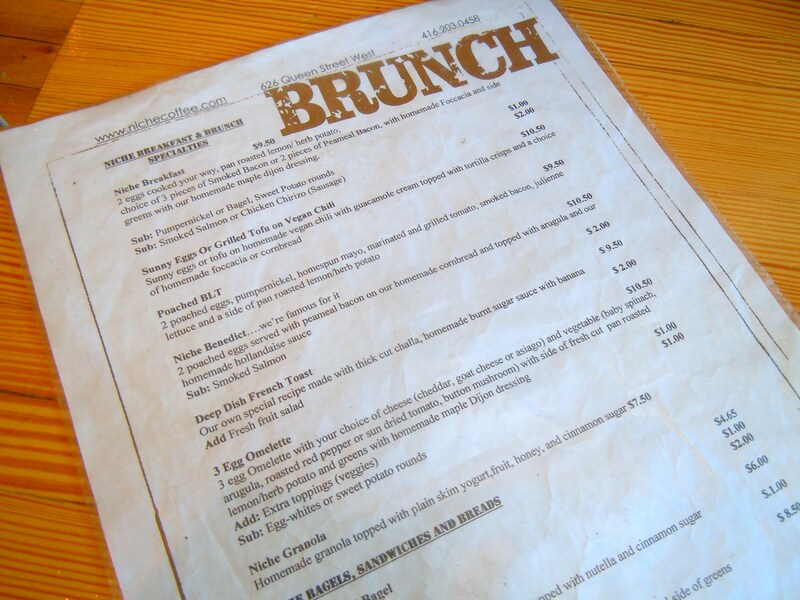 Now I don’t know about you, but this was the first time I had ever come across a menu with such a varied assortment of brunch sides! Not only do all the mains come with an assortment of these sides, but they’re also available (at individual extra charges) on their own, which makes for wonderful mix-and-match fun! And the mains! Sweet mother of pearl. You have your savoury: poached eggs BLT, build-your-own cheese and veggie omelette (choose between 3 types of cheese and 5 different veggies), and the Niche’s signature eggs benedict served on homemade cornbread, just to name a few. On top of that, you have your sweet: deep dish French toast using thick challa with bananas and burnt sugar sauce, and homemade grilled banana bread with cinnamon sugar and nutella. Yes, that’s right, I said nutella. Jot that down on a sticky note now – because I have! Finally, what makes the menu even more awesome? Vegetarian and vegan options! I mean, sure, the French toast and cheese and veggie omelettes are vegetarian in the sense that they don’t serve meat, but vegans, are you ready for this? 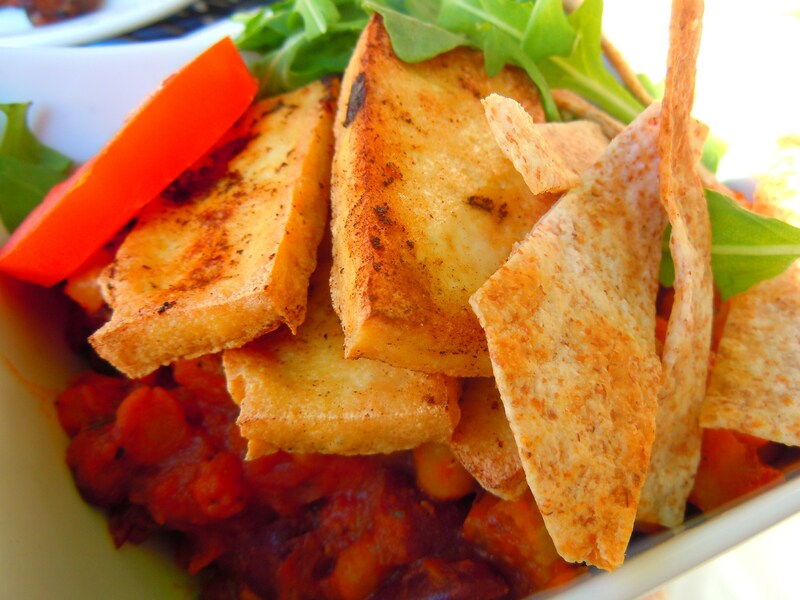 Niche has a grilled tofu on vegan chili brunch! OH.MY.GOD. When I saw it on the menu, all I could think of was, “my friends will flip over this…and I am so ordering this next time!” Individual sides average around $2-$4, and mains with all the fixins will run you around $7.50-$11. 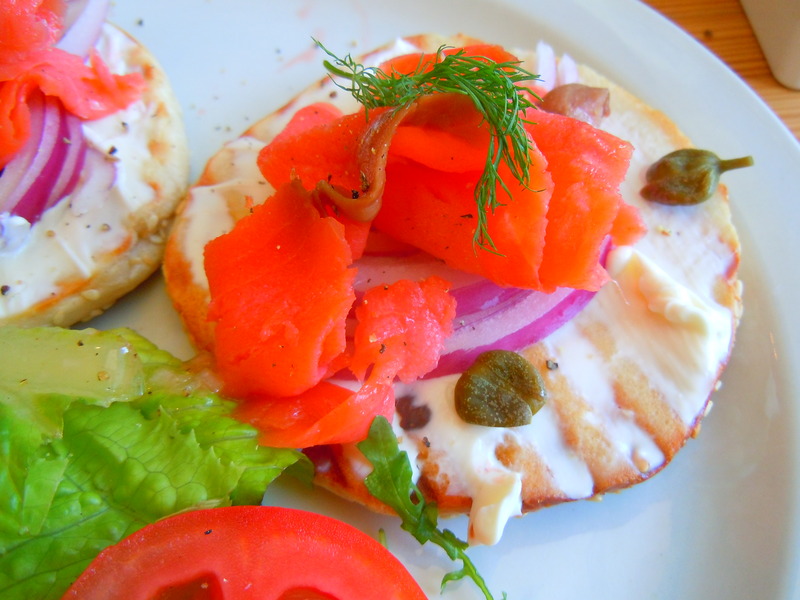 What I did enjoy on this particular morning was a delicious open-faced, toasted sesame seed bagel with cream cheese, red onions, capers, smoked salmon, and fresh sprigs of dill with a side salad of crisp romaine with vinaigrette dressing. 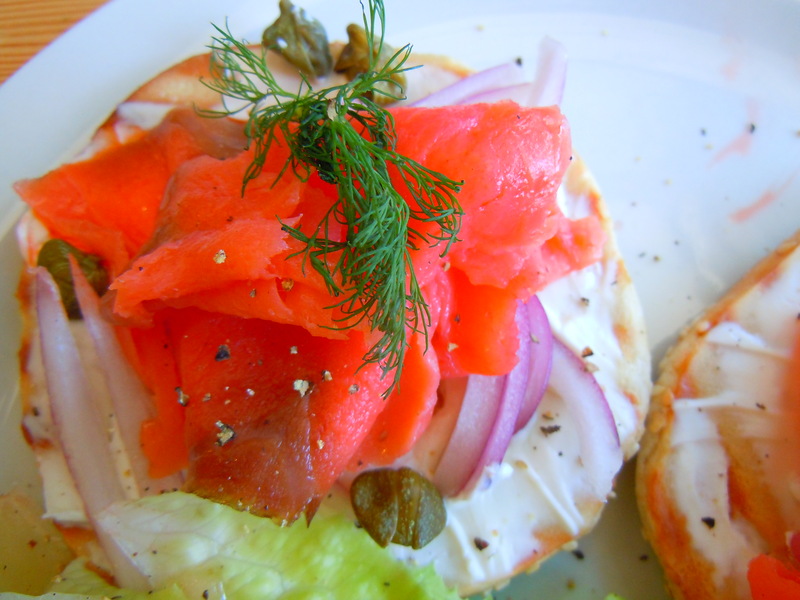 Here’s a secret: before this, I hadn’t had a bagel in years. That’s right, years. Why? 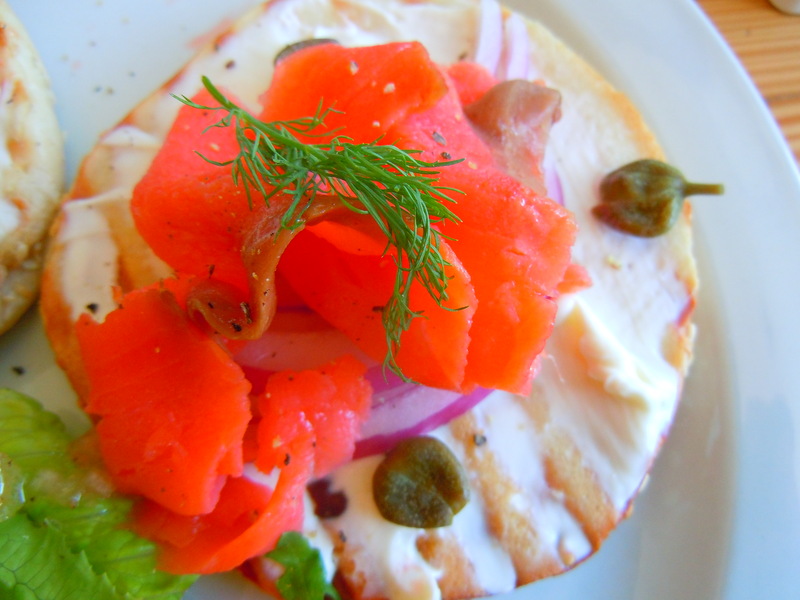 Well, I’m a little embarrassed to say this, but I cut bagels out of my diet because I was put-off from the jumbo-sized ones I kept seeing that looked as though they had been pumped with steroids. I thought, “geez Louise, I could throw one of these into the wall and make a dent because they’re so darn dense!”. It didn’t sit well with me so I stopped eating them altogether, even my beloved Tim Hortons bagels that are actually a good size. Niche is a beautiful, breezy brunch and café spot with an outdoor patio in the back and an open storefront during nice weather. 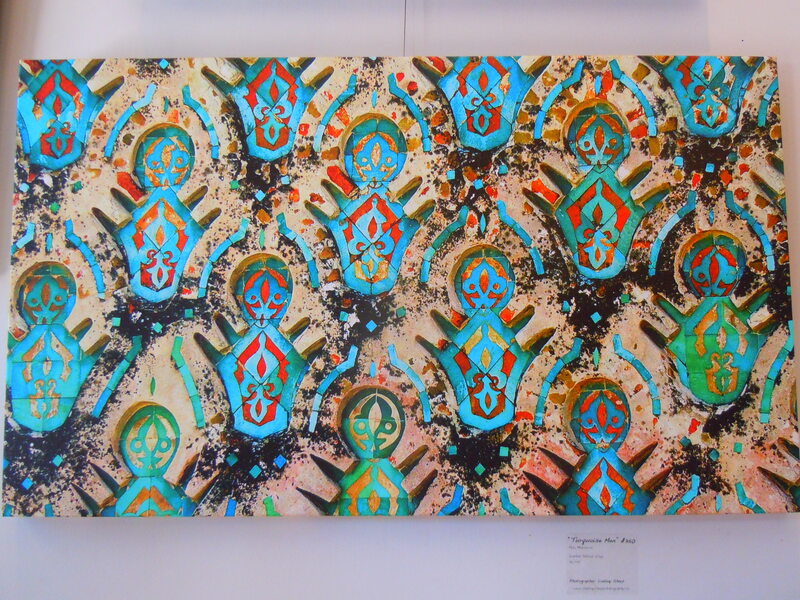 There are gorgeous paintings and artwork on the walls, and there’s plenty of grab-and-go snacks at the counter including marshmallows squares with chocolate and dried fruit, scones, muffins, and other pastries. 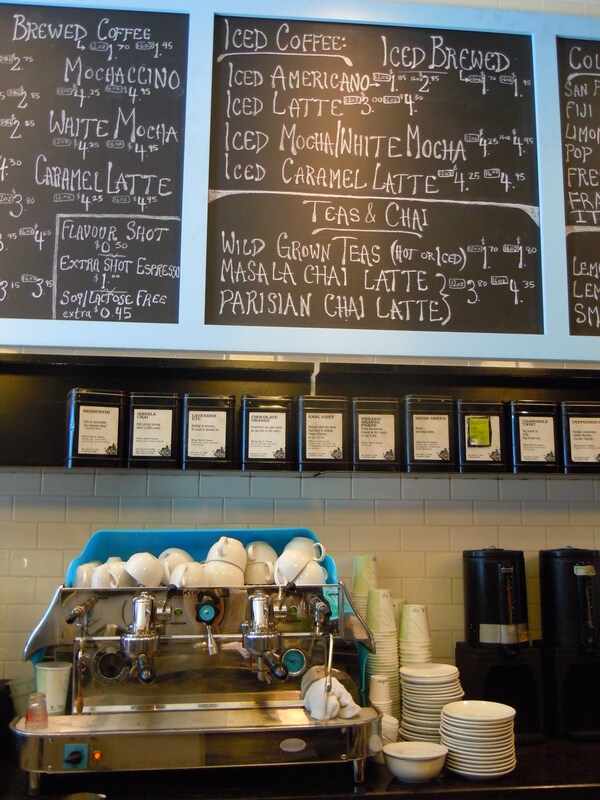 Since Niche is a coffee and tea café, they also have a whole blackboard menu up top dedicated to coffee (brewed coffees, espressos, white mochas, lattes, cappuccinos, etc. 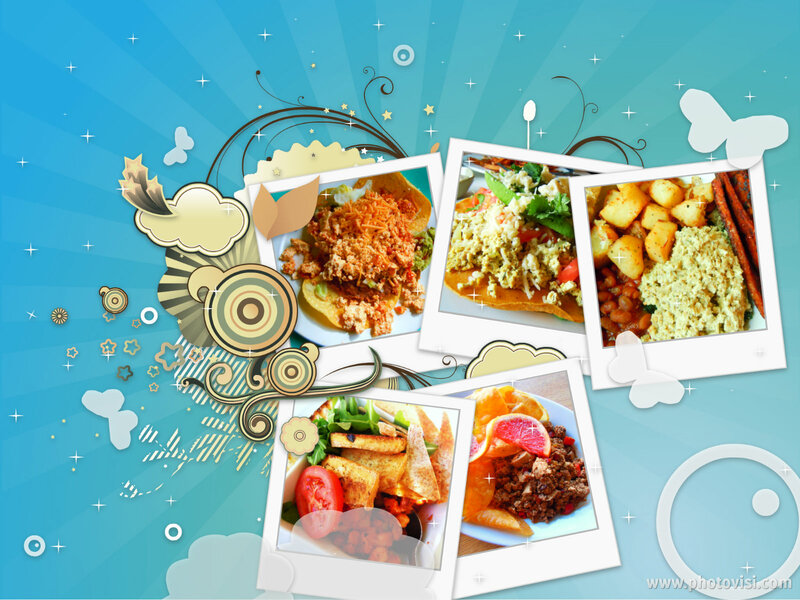 ), chilled coffee drinks, tea and chai, Italian soda, homemade lemonade, and a host of others. You can bet I’ll report back with some drink goodies for all the next time I’m there! It’s a lovely spot that I’m so looking forward to going back to and given the menu tidbits that I gave you guys, I wouldn’t be surprised if you made your way there before my next visit. I'm Deb and I'm a 29-year-old young lady residing around Toronto. I scrapbook my food photos, I love eating food, and I love photographing and writing about it! My heart belongs to baking, sweets, and sushi. Follow me on Twitter, I'm AtebyAte! All images and material are property of Ate by Ate and should not be taken or used without the consent of the blog owner. Toronto Tea Lovers, Celebrate with Tea – Support & Shop Local with The Sugared Teacup’s *NEW* Tea Gift Box Business! Just When You Thought You Couldn’t Love Chocolate More – A Recipe for Twin Chocolate Delights Cookies! In Love With the Three “S’s”: Sandwiches, Sweets & Scones – Afternoon Tea at Annona at the Park Hyatt in Yorkville!